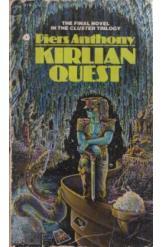 Kirlian Quest by Piers Anthony, Sci Fi. Herald the Healer, a descendent of Flint of Outworld, must abandon Psyche to face witchcraft charges as he races to solve the ancient riddle of Mars before a massive invasion can arrive. Part of the "Cluster" series. Book is in good condition, all pages intact.